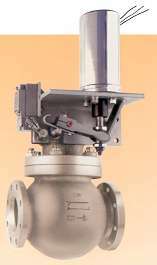 Series 2500 valves are 2-way, globe-type, piston valves. They are operated by an external lever connecting the lifting action of the linear actuator to the valve piston/plug through a rotary shaft. The Rotary Shaft principle creates a mechanical advantage enabling more force in operating the valve. It also allows stronger return spring action to ensure reliable, fail-safe return. Isolated actuator: In the Rotary Shaft valve, the fluid is contained in the lower valve body assembly, completely away from the electrical portion of the valve. Therefore, there is no possibility of explosive gas or corrosive liquid leaking into the electrical enclosure, as there is in any packless type solenoid valve. High temperature capability: Because the magnetic plunger and the solenoid are mounted outside and away from the valve body, up to 425�F fluid temperature, including steam, can be safely handled without coil insulation breakdown which is often associated with packless type solenoid valves. Quick acting, two position: Speed of operation is less than one second and is independent of line-media conditions. Manual operation provision: In case of an emergency or for trial operation, the valve may be operated by hand using the external lever. Visual position indication: The external lever also serves as a visual position indicator. Corrosion resistant materials: All internal parts are made from 316 stainless steel. High pressure capability: The mechanical advantage provided by the external lever of the rotary shaft type enables the valve to be fitted with a much stronger closure spring than is possible with any direct-lift packless type solenoid valve. This allows a much higher opening pressure and/or a greater factor of safety for opening and closing the valve. Much longer maintenance-free life: The slight arc (15-30�) of the rotary shaft offers superior seal life expectancy compared to reciprocating-stem packing glands. Dependable shut-off: Pressure and flow (above the seat) tending to close the valve achieves shut-off reliability not possible with ball, gate, or butterfly type valves. Zero pressure operation: Valve is not dependent on pressure or flow to open or close fully. No tiny orifices: These valves contain no diaphragms, needle-sized orifices or piston rings typical of packless type solenoid valves which are prone to clogging. Heavy walled valve bodies: All valves have heavy walled cast bodies which meet the ANSI ratings of class 150 & 300 for steel. A Doubled Seal System: Ensures an absolute minimum of fugative emmissions. The primary seal is Teflon� with a spring-loaded, secondary seal. All Leslie Control valves are 100% factory tested and serialized. Leslie Controls' quality assurance program is accredited and certified to ISO 9001.